PPI in association with Ati Ling is delighted to host the thirteenth annual Padma Dakini Retreat with Jigme Tromge Rinpoche as Vajra Master. This event is held annually to commemorate the November 17th 2002 date of the parinirvana of His Eminence Chagdud Tulku Rinpoche, our beloved teacher who established the Chagdud Gonpa Foundation in the West. The retreat will be based on a Dharma treasure (terma) of the late Chokgyur Lingpa, a contemporary and spiritual brother of Jamyang Khyentse Wangpo. Chokgyur Lingpa is regarded as the last of the one hundred major tertons (treasure revealers) and the universal monarch of all Tertons. Chokgyur Lingpa (1829-1870) displayed many amazing miracles throughout his life and worked alongside Jamyang Khyentse, Jamyang Kongtrul, Mipham Gyatso and Patrul Rinpoche in developing the Rime Movement, a non-sectarian approach to integrating all major schools of Tibetan Buddhism. Chokgyur Lingpa’s fourth incarnation, Tsikey Chokling Rinpoche, bestowed the Padma Dakini empowerment when he visited Ati Ling in 2000 and 2004, and we are privileged to maintain the practice of this treasure under the guidance of Jigme Tromge Rinpoche, who was recognised early in life as being the reincarnation of Tsewang Norbu, the son of Chokgyur Lingpa and regarded as an Avalokiteshvara emanation. Empowerment is required to attend the retreat. Please email us at events@atiling.org if you are interested in attending but do not have the Chokling Padma Dakini empowerment. 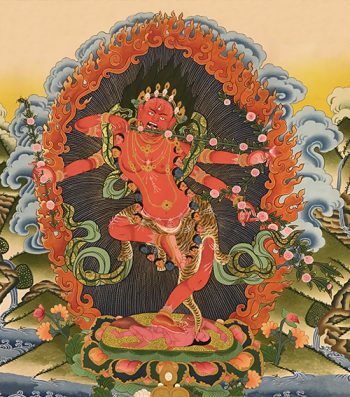 Texts required for the drubchod are: Padma Dakini, Galaxy of Heartdrops and Protectors, all of which are available for sale at PPI’s Lotus Light store. TIME: The retreat will begin on Friday morning at 9.30am and end on Sunday evening around 5.30pm. COSTS: Per person per day (includes meals, tsog feast, accommodation). Day-only is for those arriving and departing on the same day and the only meal included is lunch. All prices go up $10/day on November 17th! Cancellation and refund policy: please note that for any cancellation within 7 or fewer days of the event start, a charge of $25 per event day will be deducted from the refund. Thank you! 1) To make an offering by credit card online follow the link below and from the pull-down “Program Designation”, select tsog or butterlamps. 3) by calling the events coordinator at 707-544-8029 to arrange payment by credit card. Please email us at events@atiling.org. © 2016 CG Ati Ling. Thank you for not copying any parts of this website without express permission of Ati Ling.